Travel journalist and dreamer, Celeste Mitchell, was an actual dream to work with. Her portfolio of images from all over the world was the perfect inspiration to create her new home online. We wanted the space to be clean and minimal while still speaking to her fun, dreamy side. Her home base is in Australia, but she travels the world, so we wanted that to come across with her strong images and the bold fonts shown throughout. The use of pink, cactus and a muted green palette help frame all of her adventures. We did a Restyle with Celeste on one of our favorite Website Templates, Always, since Celeste was looking for a clean, minimal and dreamy look on her site. We loved creating the cactus graphics the most! They played into the rich pinks and textures to add depth to her branding. Check out our Q-and-A with Celeste! CELESTE: I’d always enjoyed writing and even used to record news bulletins onto cassette tapes with my brother while we were in primary school. Yep, totally daggy. And I love to read – I was a library kid from a young age, pouring over books and writing poems and stories in my diary. But I think it all kicked into gear when we had to choose somewhere to do work experience during high school and I was lucky enough to join the newsroom at the local radio station for my week’s internship. I was thrown into the deep end, writing news stories and coordinating interviews and I absolutely loved it! GO LIVE HQ: WHAT'S THE HARDEST LESSON YOU'VE LEARNED IN YOUR BUSINESS? CELESTE: How to switch off. Actually, I’m not sure I’ve learned how to yet and I’ve been freelancing for four years now. When you’re the boss, everything and everyone you work with and for depends on you. When you love what you do it’s easy to become completely absorbed in your work but I’m now working on creating a healthier split between ‘work' and 'life outside work.’ Also, getting caught up in the comparison trap is THE most debilitating thing you can do if you’re trying to run a business as a creative. GO LIVE HQ: WHAT DO YOU WISH SOMEONE WOULD HAVE TOLD YOU STARTING OUT? CELESTE: You don’t always have to say “yes.” Other jobs/commissions will come along and there’s no point burning yourself out in the quest to please everyone. GO LIVE HQ: WHAT MADE YOU TAKE THE JUMP INTO WORKING FOR YOURSELF? CELESTE: I guess I’d always seen freelancing as the ultimate end-goal in my career but it was only after working for 10 years and having built up a solid base of contacts that I felt ready enough to take the leap. When people ask me this question, I say it’s a matter of self-confidence. You’ve got to believe you can do it, have a bit of money behind you or line-up a regular gig that will pay your important bills (I was editing a One Direction mag when I first went freelance!) and then just jump! Everything will fall into place if you’re truly prepared to do the work to make it happen. GO LIVE HQ: WHAT HAVE YOU GAINED FROM FOLLOWING THIS DREAM? CELESTE: Working as a freelance writer has not only allowed me to live where I choose – which happens to be in a lovely coastal town where I grew up, and where I moved to to live with the man who became my husband in February this year – but to see the world and tell some of its stories. I’ve been fortunate enough to do some pretty epic adventures in the past four years – from strolling the streets of Rome, to marveling at the wonder that is Petra in Jordan, to swimming with whale sharks in the Maldives and going on an Alaskan cruise with my mum. And I am SO grateful that I can call this work. GO LIVE HQ: WHY DID YOU DECIDE TO TAKE YOUR BRAND FOR A RESTYLE WITH US? 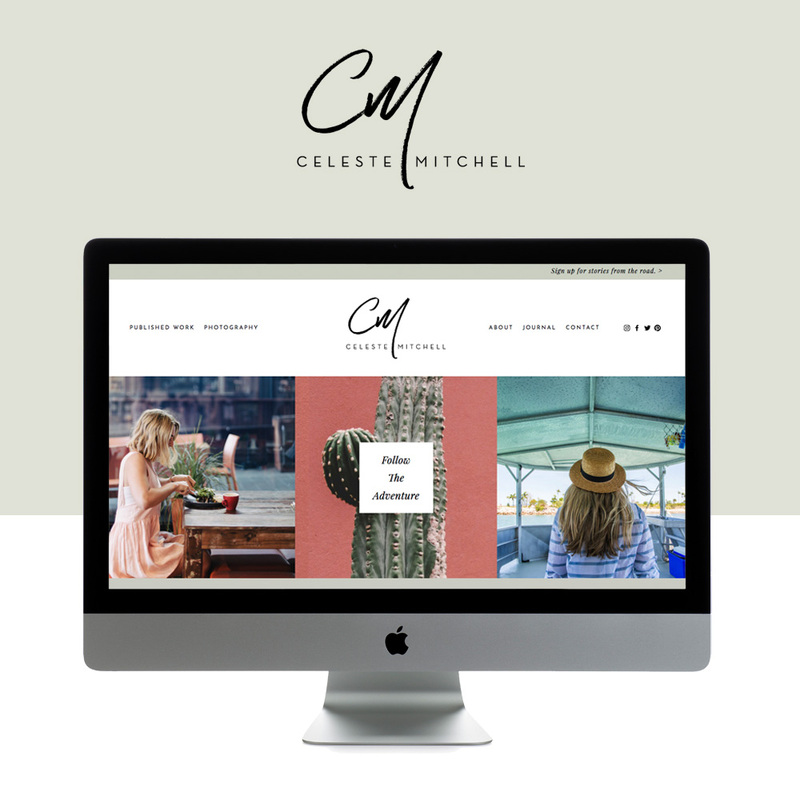 CELESTE: I’d been considering a switch to Squarespace for a while and had been eyeing off the templates you have in the store, but knew with my crazy schedule I was never going to get around to sorting out the technical side or tweaking the design to suit the look and feel I was after. I felt that this was the best option, especially when I didn’t need a completely custom design – at least for now – just a beautiful place to display my work that feels like me. And I’m so happy with how it’s turned out! To see what she's up to, follow Celeste on Instagram and Facebook. Want this look? Get the Always Template!